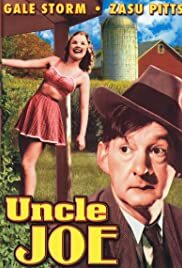 UNCLE JOE looks and feels like a Roach Streamliner, and there is music by Roach composer Marvin Hatley -- but the directors, writers and production company are complete novelties, with no other credits. Possibly these are pseudonyms and perhaps someone will do a little research. But despite the uncertainties of what was going on behind the camera, what goes on in front of the camera is a delight. Slim Summerville and Zasu Pitts can steal the screen from anyone but each other, there are four gags that are surprisingly well done, and Slim, when he is not running his farm, is an inventor, a sure source of jokes. The movie also features a very young Gale Storm, who plays the accordion. An exceeding pleasant way to spend an hour or so.